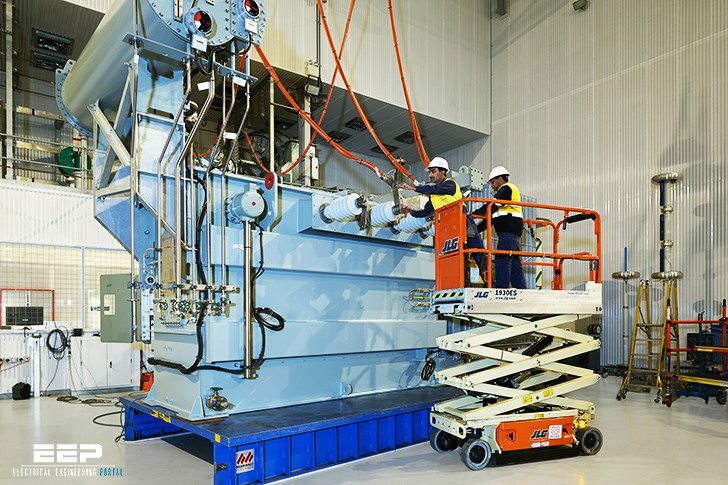 This routine test aims to measure the partial discharges which may occur in the transformer insulation structure during test. Partial-discharges are electrical arks which form the surges between electrodes of any area of the insulating media of a transformer between the conductors. These discharges may occur in air bubbles left in the insulating media, gaps in the solid materials or at the surfaces of two different insulators. Although these discharges have small (weak) energy, the thermal energies due to these discharges can cause aging, deformation and tear of the insulating material. To determine whether a partial-discharge above a certain value has occurred in the transformer at a pre-defined voltage. To define the voltage values where the partial-discharge starts by increasing the applied voltage (partial-discharge start voltage) and the value where the partial-discharge ceases by decreasing the applied voltage (partial-discharge cease voltage). To define the partial-discharge strength at a pre-defined voltage. How Partial-Discharge occurs and measured magnitudes? The structure where a partial-discharge occurred in an insulating media is shown in the simplified Figure 1. As seen on the simpliified diagram, the impulses forming on the discharge point cause a ΔU voltage drop at the transformer line terminals. This forms a measurable “q” load at the measuring impedance. This load is called apparent load and given in pC (Pico-Coulomb) units. During measurements: ΔU voltage drop, average value of apparent partial-discharge current, partial- discharge power, impulse count within a time unit, partial-discharge start and cease voltages can also be determined. Partial-discharge measurement structure of a transformer and related circuit in accordance with IEC 60270 is explained below. The measurement circuit in Figure 2 is formed according to Bushing-tap method stated in standards. Before starting to measure, complete measurement circuit should be calibrated. For this, a calibrator (Calibration generator) is necessary. The calibrator produces a q0 load with a predefined value. Calibrator is connected to the test material in parallel. The q0 load produced in the calibrator is read at the measuring instrument. These steps are repeated at all terminals of the transformer to be measured at no-voltage. After the calibration operations are completed, the calibration generator is taken away from the measuring circuit. When the power system is connected (supply generator switch is closed), the voltage level will be too low (remenance level). This value which is considered as the base noise (interference) level of the measuring system should be less than half of the guaranteed partial- discharge level. The voltage is substantially increased up to the level stated by the specifications and in the meantime the partial-discharge values at the predefined voltage levels are measured at each measuring terminal and recorded. The voltage application period, level and measuring intervals are given in the induced voltage test section. After the transformer is energised for measuring operations, the partial-discharge value read at the measuring instrument is multiplied with the predefined K correction factor, and real apparent partial-discharge value for each terminal is found. The test is considered to be succesful if the partial-discharge value measured at the transformer’s measuring terminals is lower than predefined values or values stated in the standards and no increasing tendency is observed during test. Partial-discharge start and cease voltages are above the operating voltage. Depending on the test period, partial-discharge level stays approximately stable. Increasing the test voltage causes almost no partial-discharge level change. I am really appreciated for your valuable information in this portal. You are really helping in spreading painstakingly researched knowledge to many of us. You are doing a great service to humanity. Once again, we appreciate you. Thanks alot ! You have experience analyse parttern Partial Discharge for Transformer, Cable, GIS..? Gladly look forward to your innovation of such a learning forum!! a great day for great minds!